Hope. Encourage. Inspire. Never Give Up. Hi, my name is Samantha. I am from Southern New Jersey and about 23 years old. I was born with Tuberous Sclerosis and have had numerous laser surgeries beginning in adolescence and continuing into adulthood. I have multiple angifibromas on my face (with redness) and a few on other parts of my body, ash leaf spots (no pigment color of my skin in that section), skin tags (until they were removed), and 5-6 AMLs (angimylopomas) in total attached to my kidneys. I also had a large surgery last year in 2013 that removed an AML from my kidney through a process of three surgeries. I first had it embolized, then the AML turned into a tumor-like sack which was drained, and then it came back again and was completely removed. This was my biggest surgery besides the numerous laser surgeries I have had. I had 1300 milliliters removed from my body with that one AML. I felt extremely lucky to have conquered this surgery and move through the recovery process to live a healthy life. I have had one seizure since I was 3, but prescriptions have helped prevent them from occurring anymore. I am blessed to say I have a mild case of Tuberous Sclerosis because I have not endured countless seizures or other cognitive obstacles. In May 2013, I graduated from Georgian Court University with a Bachelor of Arts in Psychology and am currently finishing up my first year in a Master’s Program for Clinical Mental Health Counseling at Georgian Court. 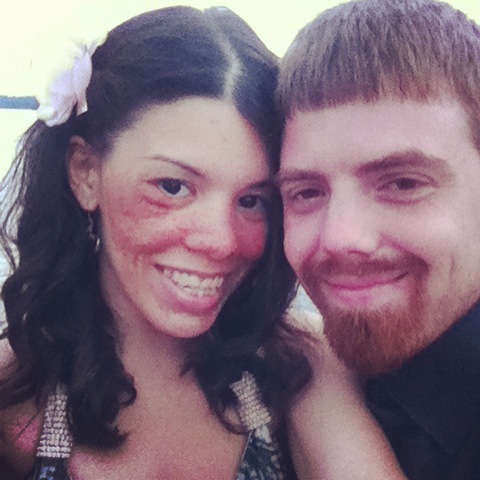 In addition, I am very blessed to have my fiance, Eric, who loves me no matter how easy or difficult the circumstances. We have a lovely life, been together for six years and engaged for about two years. We are excited to be getting married in June 2016. Overall I cherish many moments of my life because I have been able to live a healthy and happy life. My life encompasses warm memories of competing in sports from high school into college, and the arts such as musicals, drama club, and playing an instrument. I have been involved and held many leadership positions in many organizations and clubs on campus during my four years with Campus Ministry, Student Government Association, and Campus Activities Board, along with assisting many organizations with different events. I also really love to do volunteer work and have currently held two walks at my university over the past few years raising funds and awareness for Tuberous Sclerosis with the help of the TS Alliance. I am a fun, outgoing, understanding, and caring person who believes in living life to the fullest. I enjoy nature and I am always interested in new experiences. I just joined the TS Alliance Group and even though I have organized a couple walks at my university to raise funds for TSC it’s nice to be apart of a group where you can share your helpful advice and provide support to others. I love learning about people’s stories, triumphs, and overcoming the obstacles. I feel very lucky for what I have accomplished and what I continue to strive to accomplish. For a long time over the years, I felt alone with TSC because I had no connections to others with various experiences to share, connect, and provide support to each other. Although my family and friends were there I wanted to feel connected with people who could truly understand what I was and still am going through. During those walks I organized I heard incredible stories that moved my soul. I admire all those people I heard stories from that were far more difficult than mine and I continue to look up to people who deal with TS on a regular basis and see the light in their journey. There is no light once you hit the end of the tunnel, the key is to look for the light throughout your journey and turn it into a positive. I look forward to being apart of this group, learning and being there for people, and hearing your experiences. I would say having TS has made me stronger and encourages me to live a full life every day. TS pushes me to conquer everything that may seem impossible and achieve my dreams which are endless. TS does not stop us. It does not define who we are; it is only a small part of our whole person. I learned if we never give up on what we believe or want to achieve in life, great things can happen in ways that you may never have thought possible. If anyone ever wants to talk, share stories, needs advice, or support I am here to help. Previous PostThe CureNext PostThis Can’t Be.